BMREINF9 is a spreadsheet program written in MS-Excel for the purpose of analysis and code checking of steel members with various types of reinforcement configurations. Specifically, members are analyzed / code checked per the AISC 9th Edition Allowable Stress Design (ASD) Manual. Both actual and allowable stresses are computed, with the final result being a computed "stress ratio" of actual stress/allowable stress. Both the intermediate and end weld requirements for attaching the reinforcing to the existing member are determined. 3. This program assumes that existing member is overstressed primarily due to X-axis (strong axis) bending. However, the member may be also subjected to axial load (compression or tension) as well as Y-axis (minor axis) bending. Thus, the maximum resultant stress in the top flange of the composite section is assumed to be compression, while it is assumed to be tension at the bottom of the composite section. 4. This program addresses the concern of existing state of stress for original member by providing input of the "residual" X-axis (major axis) bending moment in the unreinforced member, and in some of the worksheets the "residual" axial load in the unreinforced member. These "residual" loads can be due to dead load alone or a combination of dead load and an assumed portion of the live load. 5. This program prompts for the X-axis (strong axis) "cut-off" moment for the beam, which may be input as a value equal to the total design moment, but is more typically equal to the moment capacity of the existing unreinforced member. The "cut-off" moment is the moment used to determine the end weld requirements for the member reinforcing. 6. In this program for members subjected to known loadings consisting of axial load (compression or tension) and/or uniaxial or biaxial bending, both the actual and allowable stress are computed, with the final result being a computed "stress ratio" of actual stress/allowable stress. 7. For cases when the axial load is compression, then it is considered at the top flange of the section but it is not considered at the bottom of the section. When the axial load is tension, then it is not considered at the top flange of the section but it is considered for the bottom of the section. 9. When a stiffened element (web) of a member subjected to axial compression is classified as a "slender" element (exceeding non-compact limits) based on local buckling criteria, then the program complies with AISC Appendix B. 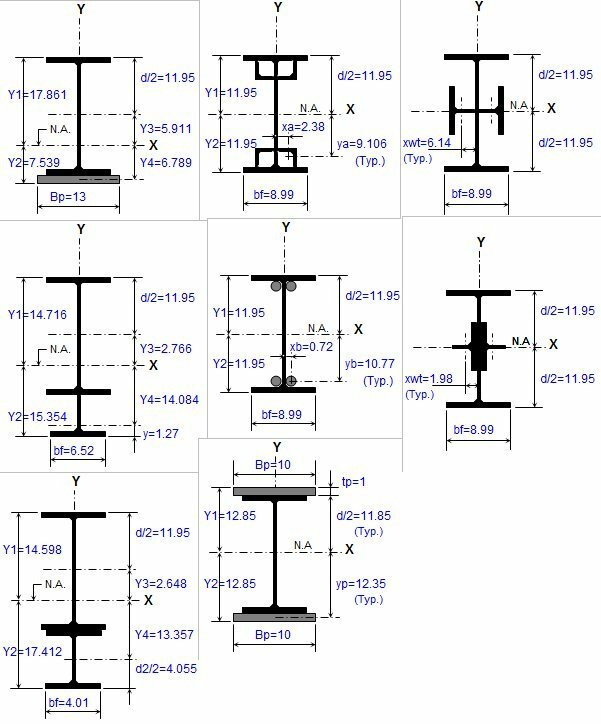 If the effective length of web for axial compression as determined by AISC Eqn. A-B5-8 is found to be less than the actual web length, then the area of the web to be deducted is assumed as one-half each side of the centroid of the existing beam for determining the effective section properties. 10. This program utilizes an "Allowable Stress Increase Factor" (ASIF) which is a multiplier of any of the calculated allowable stresses Fa, Fbx, and Fby and also the Euler column buckling stresses F'ex and F'ey. It is used and appears only in the stress ratio calculation. Typically a value of 1.0 may be used. However, a value of 1.333 may be used for load combinations which include wind or seismic loads. 11. If a member loaded with axial compression has a maximum slenderness ratio K*L*12/r >200, then a message will appear. However, this program does not consider or deem a particular member as "inadequate" based on the slenderness ratio of 200 being exceeded. 12. For the case of combined axial compression with bending, if the calculated value of fa >=F'e (which is not allowed) then a warning (error!) message will appear. 13. When the values of either 'Lx', 'Ly', or 'Lb' are input = 0' (or actually <= 1.0'), this program will use a value = 1.0'. 14. When the area of the top (assumed compression) flange is <= the area of the bottom (assumed tension) flange, then this program will not consider the use of AISC Eqn. 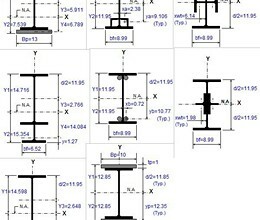 F1-8 per Section F1.3 in determining the allowable X-axis bending stress, 'Fbx'. 16. This program does not calculate or check shear or deflection in member. 17. This program does not consider torsion on member. 18. This program does not consider deduction for holes in members subjected to tension. 19. In weld design, this program determines the AISC Code minimum fillet weld as well as the maximum effective fillet weld size based on the shear strength of the base material. The weld size used will be the AISC minimum weld size, not to exceed the maximum assumed value for a single pass weld of 5/16". If the maximum effective fillet weld size is less than the actual size used, then the maximum effective fillet weld size is used to determine the actual required weld lengths. * BMREINF9 download link provides freeware version of the software. BMREINF9 has been rated 5.0 out of 5 points. A total of 2 votes cast and 0 users reviewed the software.